So many teachers have shared assessments, tests and tasks and many exams on the Tech Teachers site via our Upload page. We have a shared repository of hundreds of documents! I hope that continues to grow. BUT, I was thinking the other day: what about just plain activities that my students can do which simply reinforce the skills we’ve been teaching them? No tests, revision, practice exams…just fun activities that allow them to practice the skills. All shared in a dedicated place, no searching through assessments etc. to find them. My reasoning is simple. There are always kids in my classes that finish their work early, or sometimes a whole lesson goes a little faster than planned. Doing nothing in the time that is left is no good as nothing productive comes from that. 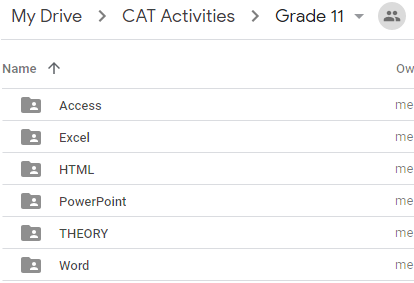 So, I have created a public shared folder for all teachers to access to upload and download activities ONLY in the relevant folders, as seen in the pics below. 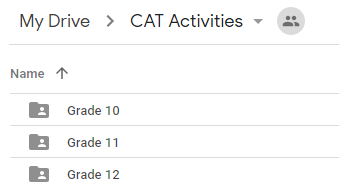 What if the activity I have is relevant for more than one area or grade? Try keep your activities centred on a main application and place it in the most relevant folder. If it’s relevant for more than one, then place it in each folder it fits in. It makes it easier for a teacher to simply open the folder, choose the area and grab an activity, even if it’s duplicated elsewhere. Do NOT edit the activity in the Google Drive, download it to your own machine first and edit it on your machine. Do NOT delete any activity that is not yours. 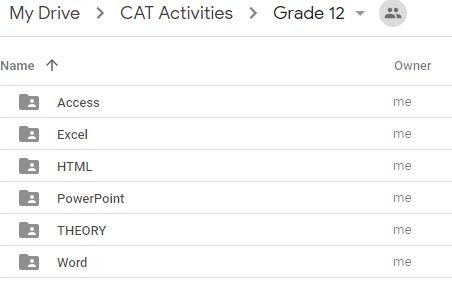 Only upload activities, NOT assessments or tasks for marks etc. 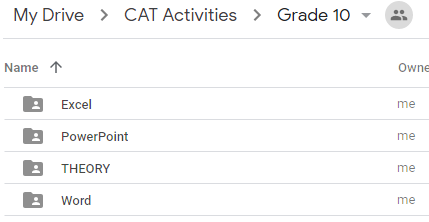 So, go ahead and start dragging your activities into the folders so we can all benefit together!